Our part of the poem was stanza 9 and stanza 10. From this phrase, we each devised our own way of getting the stanzas out into the wider community, perhaps to those who might not ordinarily experience poetry. We decided to set out into our own communities in order to get the stanzas out as far and wide as possible, and to all have a postage element to our strategy. I chose to focus more on the tenth stanza, while keeping this idea of distribution. Where the ninth stanza is firmly stated in ordinary, daily life, the tenth is more whimsical, lending itself more to the imagination with lines such as "historical tide that flows" and "rainbows of effluent hope / swirling in the same spring-time." From this, I found the idea of discovery. In terms of 'the package,' discovery is a vital part of the experience; opening to a thing which may bring surprise or despair. This unknown element sits well with the idea of the whimsy which is demonstrated in the tenth stanza. I decided to deliver the tenth verse through a 'message in a bottle' kind of way, in order to solidify both the imaginative qualities of the poem and the static norm. The message in a bottle was once used as a way to communicate by both the British Navy in the sixteenth century and in World War Two. However, this piece of history also inspired several pieces of art, such as Edgar Allen Poe’s 'M.S. Found in a Bottle', and the Police’s hit, 'Message in a Bottle'. This blend of scientific fact and poetry made me think of the article written by Peter Forbes, where he says how both poetry and science complement each other, both in large and small ways. He also comments on how these two different concepts can be combined in one human being - such as Leonardo Da Vinci. He is a man who is placed within an everyday society, who single-handedly possesses the perfect blend of art and science. I find the idea of a normal man holding something overworldly and mythical inspiring, and this helped my thinking in how I was to construct the bottle itself. I found myself layering both whimsy and reality upon one another; the whimsy of the written poem is printed on the static societal paper, enclosed in the familiar norm of the beer bottle, which itself is enshrouded in this mythical notion of the 'message in a bottle.' I think that this has created a complex conversation as to how the 'discovery' element operates. Although the receiver is finding a 'normal' item, he is also discovering the imagination enclosed, and vice versa. I chose everyday beer bottles (Corona and Hagan) and inserted a small paper version of the tenth stanza. Because I was to be planting these bottles at the beach, I decided only to use the tenth stanza, as this has direct connections with water and land. Lines such as "the grass / beside the water" made me think immediately of Rothesay Bay beach, where the water is lined with a bed of grass. To enforce the idea of 'distribution' and the notion of postage and parcels, I dressed the bottle up in societal constructions, such as the labels "For You" and "Love Ian Wedde," and the twine bow at the top of the necks. 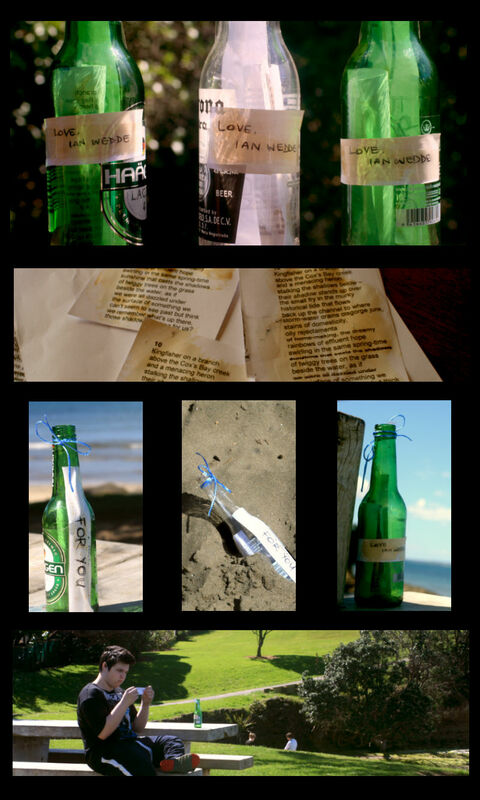 I placed the bottles on a table, on a bench and in the sand of the actual beach, and waited. I watched as a boy picked up the bottle and read the paper inside. He frowned, and gave a small smile (which I hopefully didn’t imagine) and captured this moment of discovery with my camera. He sat reading it for a while, before placing the poem inside his pocket and walking away. I feel like our distribution of Ian Wedde’s poem was successful. Getting poetry out into the wider community is important in terms of the longevity of 'the poem,' and I am glad to have done what I could to help. Forbes, Peter. 'Science and Poetry: greatness in little.' Nature 434 (17 Mar 2005): 320-323. Wedde Ian, Shadow Stands Up. 1-10. NZ Poet Laureate. Aug 2011-May 2012. Katie Carey has just completed her Bachelor of Arts at the University of Auckland, majoring in both English and Drama. She is currently working on a play called The Uncertainty Principal, which will be performed early in 2013 as part of the Auckland Fringe Festival. Past this the future is somewhat uncertain, yet poetry will most definitely be an integral part of life to come.